MBG Tools is a stand-based forest inventory data management software. It currently is being used on approximately three million acres across the United States. MBG Tools provides a user interface for cruise compilation, merchandising, data management, reporting, and growth projections. 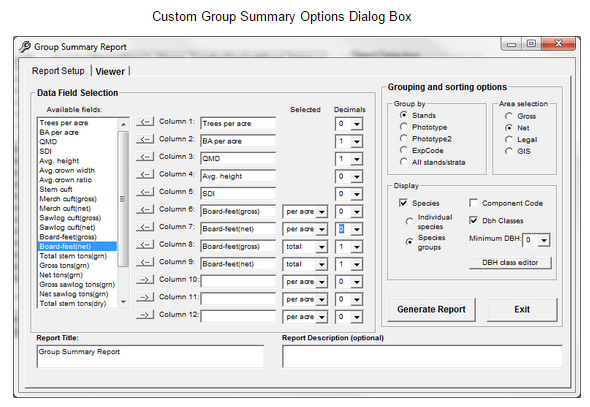 Developed in 2002, MBG Tools allows the user to select from multiple taper systems and growth models. Reporting can be customized and includes stand tables and log stock tables, for individual stands, groups of stands, or timber types. Configurable Settings and Inputs – Standard tables can be easily populated with custom data to reflect regional, enterprise, or dynamic data. MBG Tools has the ability to compile complex cruise designs featuring a mix of plot types, sizes, and taper routines. Standard and Custom Reporting – Standard and custom reporting capabilities produce inventory reports with varied spatial attributes. Data Exploration – The interface supports data mining and quality assurance by allowing users to browse relevant data and lookup tables and perform on-the-fly data filtering and sorting. Accurate Merchandising – Projections and merchandising are done on individual trees, as opposed to ‘average trees’ in a stand table. Role-Based Authorization – Directory group membership is used to authorize access and protect data while enabling authorized users to add, delete, and modify data. Best in Class Security – Integrated Windows Authentication provides robust security. Low Maintenance Cost – Shared data supports solid decision making and reduces transfer and update costs. User-Friendly Compilation Interface – Common field data import and cruise compilation tasks are facilitated using an intuitive and easy to use user interface. Trending Data – Data are stored at the stand, plot, tree and log level. The retention of individual tree detail offers unique opportunities for examining growth, mortality, and other functions. Cruise Data Quality Control – When combined with MBG Cruise, field data are collected using built-in quality assurance/quality control processes and additional validation is applied during data import and analysis steps. Flexible Cruise Designs – MBG Tools supports a wide variety of cruise designs including variable, nested, transects, and more. Cruise Expansion – Flexibility with regard to identifying source stands and target stands for the process of expanding cruise results to uncruised stands. Learn more about MBG Tools at DendroMetrics. DendroMetrics LLC is an affiliated MB&G firm.